With the rise in educational apps, corporate e-learning and online degree programs, our UX team is faced with new and exciting challenges designing experiences that are focused on how people learn. At ExtensionEngine, we're not just creating online learning programs to optimize short term usage metrics. Instead, our primary goal is for the user to come away from the learning experience with a new capability that is both retained and useful. Research shows that UX directly effects how well users learn and it is no longer enough to bring tried and true best UX practices to the table. Our UX discipline has evolved and now requires the team to have a much clearer understanding of education theory, pedagogy, psychology and instructional design. 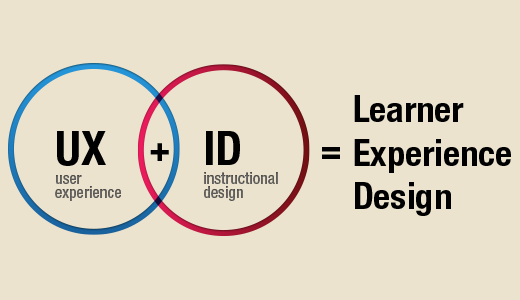 This area, the intersection of user experience and instructional design services is called Learner Experience Design or "LXD." Although LXD is a relatively new term in the field of design, there are some established best practices emerging as applied to creating online learning programs. People learn better from a combination of text and visuals - No rocket science needed here but testing shows that people learn better when text is complemented with visuals which could be illustrations, diagrams, video, audio, pictures, charts and animation. Avoid gratuitous video/audio, sidebars - Research has shown that users tend to get lost when tangential or extraneous information is added. An example could be background or ambient music that’s playing behind the content. Contextualize learning to real-world examples - Learning in the context of a futuristic sci-fi world or game-like application would make it that much harder for users to contextualize to a real-world application. Create space within the interface for feedback - It’s important to incorporate space for answers and feedback in proximity to the questions they're referring to. Provide students with control - It’s important to let students control their pace, control video and audio levels and even allow them to review prior content. Studies show that only advanced students should be allowed to control the sequence of the curriculum. Provide tools based on the type of activity - Different types of learning activities warrant different types of tools. Activities or interactions that take place over time or require research might benefit from group forums or boards whereas activities such as group interactions or social presence might utilize chat or live classroom sessions. Don’t separate related content (text and visuals) - Research has shown that users respond better when related text and image are in proximity to one another. This sounds obvious but many designers find this aesthetically challenging. Graphics should be relevant vs. fancy decorations - Designers naturally want to compliment content with relevant graphics and imagery. Tests have shown that too many graphics leads to cognitive overload which eats into the user's processing energy. Better to keep things minimalistic. Use movement (animation) to teach physical procedures and static imagery to teach processes - From an early age, humans have been taught to learn motor skills from observation. In contrast, understanding processes requires most to go at their own pace, thus a series of static images is more successful. Humanize the instructional content - Research has shown that humans respond better to human beings rather than machines thus video or even virtual coaches, characters and avatars are better at helping people learn. Want to learn more about our learner experience design expertise and how we can help you achieve your online learning program goals through distinctive online learning?